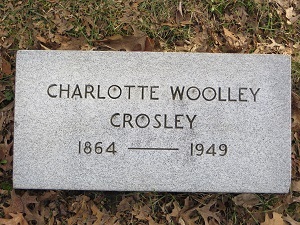 On January 14, 1949, Mrs. Charlotte Woolley Crosley passed away at her home on Hamilton Avenue in College Hill at the age of 85. Mrs. Crosley was the mother of Powel Crosley Jr., founder of Crosley Radio and WLW, the Crosley Motor Car Company and owner of the Cincinnati Reds. Her husband, Powel Crosley Sr., was a prominent lawyer and real estate developer in Cincinnati and had played an integral role for many decades in the First Universalist Church (our congregation’s name at the time). He had represented the church as its attorney as well as holding numerous elected positions with the church organization. He died in 1932. Powell Crosley and Charlotte Utz were wed on October 8, 1885 in a ceremony conducted at her parents’ home on Gilbert Avenue. The wedding was officiated by the Rev. Marion Crosley, brother of the groom and a prominent Universalist minister who was serving in the state of Maine at the time of the wedding. Mrs. Crosley was the daughter of Lewis and Elizabeth Woolley Utz. Charlotte Crosley graduated from Woodward High School and then attended the Cincinnati School of Design and later the College of Music where she studied piano. In her obituary in the Cincinnati Enquirer, it was stated that outside of her home, which was her primary interest in life, she found her greatest satisfaction in working with the First Universalist Church on Essex Place which her grandparents had helped to found. At her death, she was one of the church’s oldest members and was active in church affairs right up to the time of her death. Mrs. Crosley had especially been a vital member for decades in the church’s women’s groups including the Clara Barton Guild and the Service Society. Survivors included sons Powel and Lewis Crosley, and a daughter, Mrs. Albert B. Chatfield; two sisters, Miss Henrietta Utz and Mrs. George Caskey; five grandchildren and seven great grandchildren.